The colour theme was easy but I struggled with the challenge theme at first and looked for inspiration from my thousands of tracks in Itunes but nothing inspired me. Then I thought about singing - when we sing we sing notes! 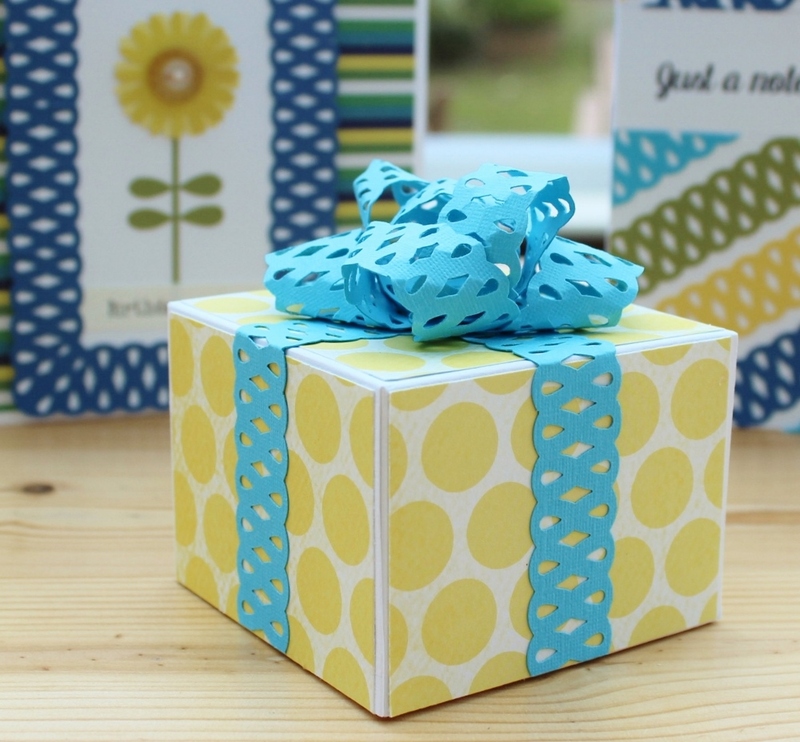 so to incorporate the colour scheme and challenge theme I have made a set of note cards and a gift box. 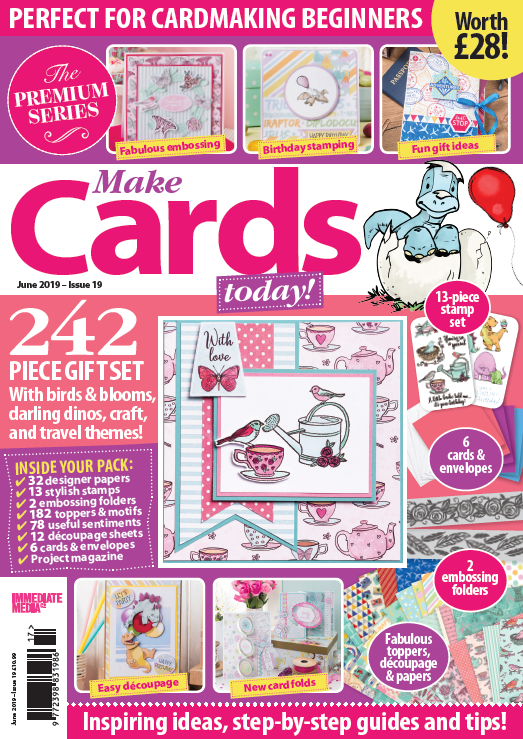 Each card is decorated with K & Co and Artylicious paper, stamped images, eyelets, brads, die cut flowers and lots of hand stitching! The hand stitching took ages but I think it was worth it as it's much neater than machine stitching, should I say much neater than my machine stitching! The sentiment on each card is 'Just a Note'. The Basic Grey challenge this week is 'Texture'. 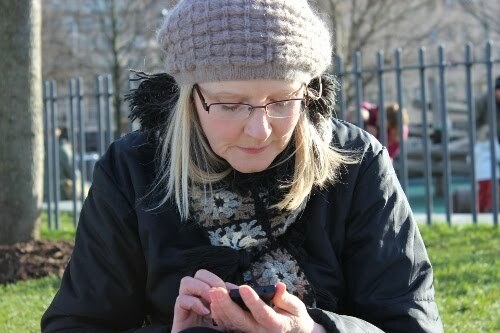 I took inspiration from DT member Anthea's stunning take on the challenge. I struggled with the proportions, mulling it over for 2 days, but at last I'm happy (sort of!). I used Offbeat papers. Photos are definately improving ;-). both these shots were my 1st attempt! 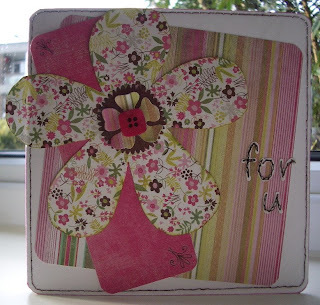 The DCM dare this week, as it's Mother's Day, is a card for the girls, so easy peasy! 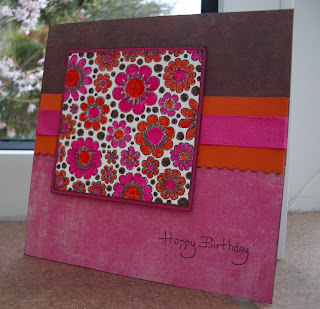 I made a gatefold card using Sassafrass Lass papers again! 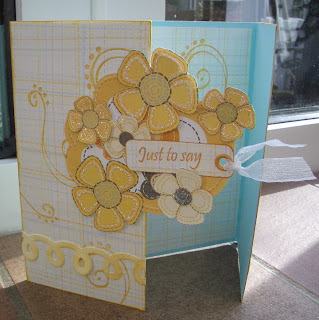 - just love the colour combo - stamped some swirls on the body of the card, inside and out and added glamour dust to the flowers. I've stamped 'Have a Great Day' inside the card too! 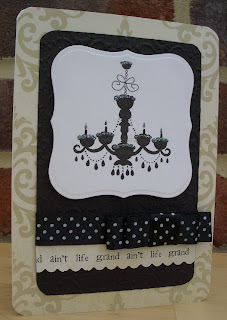 I'm quite happy with the result although I wish I stamped the 'Time Flies' and '70' in black now! Great sketch over at Raspberry Ribbons this fortnight. 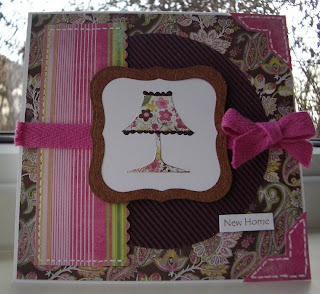 I've used Cherry Arte papers and ribbon from Scrapshed. 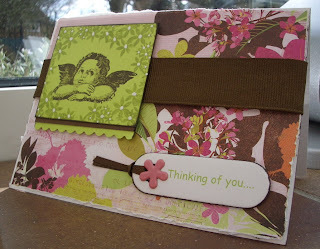 The image and sentiment is another from the Pink Petticoat 'Simply Delightful' range. No pink or stitching for a change! 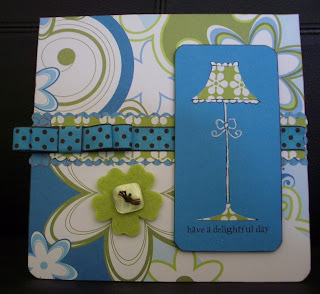 This week the BG challenge 26 is 'all things round', so rounded corners and not an angle in sight! I've used BG Sultry papers. Embroidered the border and the sentiment. 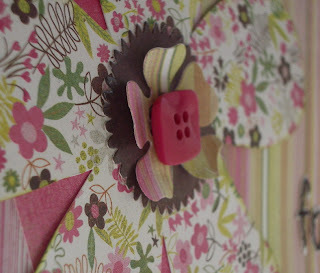 I've got the stitching bug, can't resist adding stitching to every card I make! The dare this week over on DCM follows the theme of the cookery programme 'Ready, Steady, Cook'. 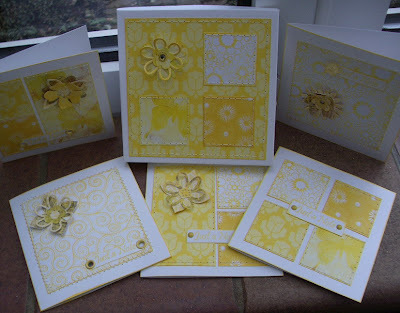 I used 3 different papers from Sassafrass Lass 'Sew Fine' collection (a bargain from Scrapshed! 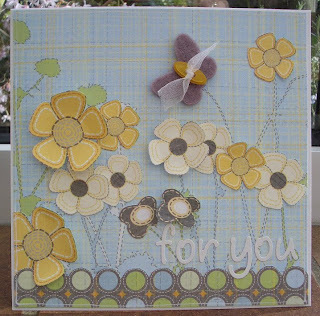 ), chipboard lettering and the felt butterfly is my extra item to which I've added the button and ribbon from Blooming Felt. Happy days! Lovely sketch from Dawny over at PTW. I used a gorgeous new image and sentiment from Pink Petticoat - part of the 'Simply Delightful' range, it's on offer 'til the end of the month - result! The background paper is from PP too. 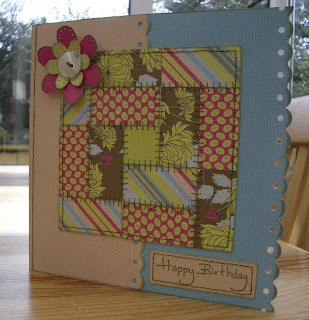 Also used the textured textile cuttlebug embossing folder and nestabilities and glamour dust. Another great sketch from Raspberry Ribbons. Thought I'd have a go at paper tearing this week as I've seen a lot of it about - enjoyed the experience! 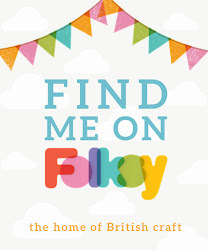 Not my favourite 'make' - certainly room for improvement I feel. Over on PTW the challenge this week is Hot Chocolate - Pink and Orange is the 'hot' part and the brown is obviously the chocolate! Bit unsure of the colour combo working for me at first but I found using such bright colours uplifting! My second attempt at a 'manly' card. I find them so difficult! Still I think this one is better than what the shops have to offer - fishing scenes, footballs, pints of beer and unfunny jokes! Even men like cupcakes, don't they? 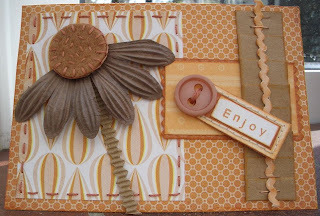 This week over at the DCM blog the dare is all about circles. 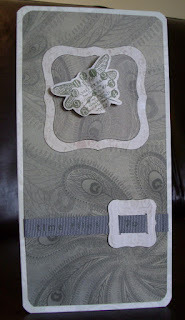 I thought it would be a great opportunity to use the embossed buttons from Craftwork cards I bought recently. I used pink chalk (not showing up very well in the photo) to colour the embossed images and highlighted with glitter and crystals. 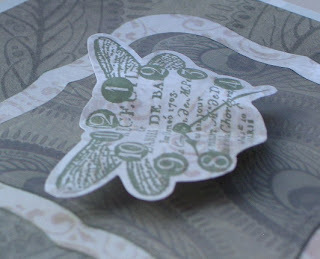 Also had a play with the cuttlebug embossing the acetate with the swiss dots folder - more circles!